Pic of the day: Yes! I've got it. "Harry Potter and the Goblet of Fire". As I waited for the bus home today, I went a quick trip to the nearby Narvesen, the kiosk that is not a kiosk. They're selling snacks, books and magazines and have grown pretty big in the more travelled places, such as near the bus station. Anyway, I looked for something interesting to read as I am close to the end of Tricycle. And then I just thought, what if they have the new Harry Potter book? I guess I should put this back on the splash page some day, since I find myself repeating it: I live in Norway, and it is not an English speaking country. Sure, those of us who are born after World War II have learned English in school, but as a second or third language. So popular books - and the Harry Potter books certainly qualify - are translated into Norwegian. This takes some time. But even when not, the bookstores are reluctant to get them in hardcover. People are not willing to pay that much for a foreign book. Except perhaps the extremely gullible or desperate. The photo says it all, I guess. There was exactly 1 copy, and it was of course in hardcover, and it wasn't exactly cheap. NOK 149, or $17.50 at current exchange rates. But I guess it beats waiting around for half a year or two until a paperback pops up - and that's provided I am one of the lucky ones who find the book before it is sold. I've tried in vain to make them order other books that were sold out. The ordering of foreign books seems to be pretty much random. They don't necessarily order in more if one is sold out quickly. So I'm pretty lucky this time, it would seem. Obviously we have not had the same Pottermania here in Norway, then. I read in international news (and online diaries) how people was waiting outside bookstores at midnight to buy the book. Kids and adults and teens. It seems they had great fun. But that's in the world. This is not the world. This is Norway. So far, I have not seen Harry Potter T-shirts, Harry Potter caps, shoes, deodorants and PJs. I'm not sure whether this is a conscious policy from the author, or the publisher, or just due to the fact that I live in a somewhat remote corner of the world, viewed through the lens of global capitalism. A nice confirmation of just how remote we are: I got an e-mail today from one of my sympathetic readers, who cited a letter to Salon magazine: "In the much-touted Scandinavian countries you live in a [censored] shoebox, pay 5 bucks a gallon for gas, thermostat is set on 55 degrees and a beer costs 8 bucks." Well, let me add a couple things: You forgot the polar bears that go rampaging through the city, killing left and right. And the mountains that are so steep that if you get up on the wrong side of bed, you fall screaming to your death on the sharp rocks far below. Oh, and the lack of roads. What would we do if the goats here hadn't been so large that we could ride them to work? On that note, I hear there is a hot debate about whether the upcoming Harry Potter movie will be English or American in its flavor. Such as whether British or American kids are going to play in it. 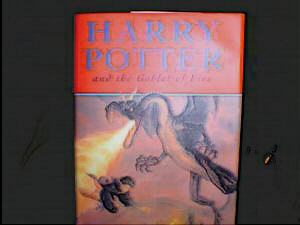 I notice that they already "translated" the title of the first book from Philosopher's Stone to Sorcerer's Stone. Heh. OK, I guess you can sympathize if I write a bit shorter than usual today. There are spells to be cast, after all.